I was a young stockbroker back then. I lived and worked in the U.S., but I specialized in international stocks. I didn't realize it at the time, but I'd accidentally landed right in the middle of a stock market Melt Up. The big story back then was China. Investors were clamoring to get in. My phone was ringing off the hook. Folks were cold-calling me... looking to open an account... something that doesn't usually happen to you as a broker. But because I had access to the Hong Kong market, I could get them what they wanted – Chinese stocks. That made me "Mr. Popular." The phone kept ringing... until it didn't. You see, every Melt Up ends the same way... with a "Melt Down." And while I don't expect it to come anytime soon, we've got to remember this lesson today. I had no idea I was in the middle of a Melt Up when all this was happening. But looking back, it was so obvious. Our group of young brokers came to work giddy every day. We were making more money than any people in their twenties probably should. It began with a 10% fall in a month. The young guys in our group started getting nervous... "Is it over?" I wondered. Heck no! The phones kept ringing. People who missed the earlier run-up scrambled to buy. Prices kept falling, but my customers didn't give up. The phones were still ringing. I'd have to give them the bad news... every day. At first, customers wanted to "double down." They wanted to buy more shares – to "lower their average cost." They were certain China would run back up. But they were wrong. The grim reality set in. 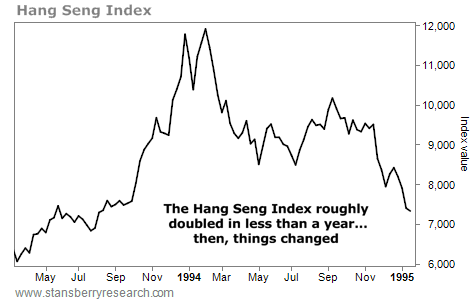 The late-1993 China Melt Up turned into the 1994 China Melt Down. I wanted to hide under my desk. My monthly income – which was all based on commission – fell roughly 90%. I went from the top of the world to, well, nearly broke. If you want to ride a Melt Up, you must have a plan to protect yourself from the inevitable Melt Down. Many of my customers back then had no plan for the Melt Down. They never lost hope... So they sunk their portfolios as they held and hoped. It can mean setting trailing stops (and following them strictly). Or it can mean diversifying a portion of your investments out of high-risk positions to protect yourself when things go wrong. The key is knowing what will work for you... forming the plan... and sticking to it. I still believe stocks will soar dramatically higher. The Melt Up isn't over yet. But if you plan to stay along for the ride, make sure you have a plan for avoiding the inevitable Melt Down. To find out why, check out his free online briefing TOMORROW at 8 p.m. Eastern time. You'll learn how he recommends you protect your nest egg today... plus, just for tuning in, you'll get the names of two of his favorite low-risk recommendations. So don't miss it... Reserve your spot now. "I believe the recent downturn showed us something important," Dr. David Eifrig says. Read more about two key ways turn lower prices to your advantage right here: A Lesson in Income Investing at the Grocery Store. "One of my researchers sent me two stock ideas," Doc writes. "But he left out one key piece of information that I needed to know..." Get the simple answer about what to look for when picking winning stocks right here.